Thousands of offices need highly-rated office chairs to provide a comfortable and productive work environment for their employees. The more comfortable your employees are, the better they can perform while at work. The interest in sourcing high-quality chairs has grown as people spend increasingly more time seated in front of a computer screen or at a desk while at work. Due to the wide selection of products available, it can be very difficult to narrow the field to the best of the best. And when you are purchasing chairs en masse or even one by one for your entire office, you need to be sure you’re purchasing the right product. To help in the search, we have compiled a list of the best rated chairs, analyzing all the most important factors, including ergonomics, design, durability and price. The Herman Miller Mirra 2 Home Office Chair is one of the most highly rated office chairs on the market for the insanely innovative features it provides. One of its most compelling features is its TriFlex back, which supports the entire spine and adapts to person’s size and movements to achieve maximum comfort, especially for extended periods of sitting. The chair also has a suspended mesh seat that supports the sitter. It molds to the shape of your bottom, instead of forcing your derriere flat, like most other office chairs. The arms are also soft, unlike most of the other options on the market that feature hard plastics which often cause discomfort. The armrests also twist inward for added customization, so you get just the right amount of support from every facet of the chair. Another key feature we think should be highlighted is the Passive PostureFit performance. PPP is an incline curve in the backrest that provides especially comfortable support to the lower spine. This feature works in tandem with the adjustable lumbar to keep your back supported and comfortable. The custom seat also features air weave suspension, which follows the natural contours of the body, distributing pressure evenly and providing natural movement and flow. The Flexfront seat edge is also one of the new features introduced by Herman Miller which allows you to lean forward without adjusting the seat pan, thereby eliminating the gap between the seat and backrest.T he harmonic tilt creates a pivot point at the hip, knee and ankle which allows you great mobility and reduces the tendency for the body to become stiff. Mirra is also distinguished, as are all of the Herman Miller chairs, for its clean and light design that showcases the high-level features and functions. It also offers colorful choices for the backrest and seat suspension that allow the user to mix or match to fit their other interior design choices, which makes this not only great for office use but also for your home office. The Mirra is not a bargain model, but if you have the luxury of a sizable budget, your employs will adore you for outfitting them with this luxury model chair. It is also rated 5 out of 5 stars on Amazon, which is as good as it gets. Of the three chairs we are reviewing for the best office chair, the Elusion from Alera is the most budget-friendly, while still packing in a stellar set of features and receiving high marks from consumers. 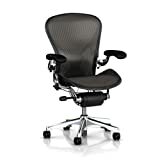 The Elusion is a mid-back mesh office chair that features an ergonomic design which adjusts to support multiple users. The contoured seat is made from premium fabric upholstery and the mesh back offers great breathability to keep you cool even when sitting for long periods of time. This chair also offers adjustable seat height with tilt. For those looking for similar features and design to the Aeron chair, without the hefty price tag, the Alera Elusion is a great alternative that we love, both when it comes to comfort and aesthetics. The Elusion is a comfortable, easy to adjust, and attractive option with a mesh back that is especially affordable and a staple in the best office chair category. For a low price, you can own a top-quality chair with well-designed features. It is rated 4.6 out of 5 stars by its customers and our top pick for employers looking to outfit an entire company. The Aeron is a beautiful and distinctive chair that fits seamlessly into any office. This chair performs as an ergonomic seat and naturally adapts and adjusts to fit users of all sizes and postures, with any activity level. With its pioneering Posturefit mechanism that supports the way your pelvis naturally tilts forward, your spinal alignment is improved and kept at its optimum positioning. The Pellicle suspension conforms to your body, which in return reduces pressure and provides top-notch support. Another benefit to the Pellicle suspension is it disperses the body heat that builds up while you work, so it keeps you cool and comfortable. This chair also effortlessly moves as one with your body with its Kinemat tilt mechanism, which means your neck, shoulders, hips, knees and ankles pivot naturally. The armrest is made of leather and can be adjusted to any height and is positioned so it slopes down slightly in the back for the most natural support. The waterfall-style front edge of the seat keeps you alert and focused as it takes the pressure of your thighs and legs so blood will keep circulating. The Aeron chair is made up of 94% recyclable materials, so you can feel good about being green. The frame is made-up of a sturdy, long-lasting polished aluminum. The Herman Miller company also offers 12-year warranty for their chairs, which shows how great their service and confidence in their product is. The warranty covers all components, including the casters, tilts, pneumatic cylinders, and all moving mechanisms. Herman Miller is a well-known brand for its sleek design and innovative features. If you have the luxury of purchasing a long-lasting, top-of-the-line chair, we suggest purchasing the Aeron. Its listed price on Amazon is less than the store price and consumers give it a killer 4.5 star rating.